The Ford F-150 is getting a facelift for 2018 with a new front bumper, headlight and grille design. But the goods behind it are a lot more interesting: the base 3.5-liter V6 is being replaced with a 3.3, the 2.7-liter EcoBoost V6 and 5.0-liter V8 are upgraded—and there’s a brand new 3.0-liter Power Stroke diesel in the mix. The look reminds me a little of a combination between the current international-market Ranger and Super Duty. Seems like that Ford-family polygon grille shape has finally snuck onto the company’s papa bear pickup truck. Ford hasn’t made any claims on the new diesel’s numbers yet besides the displacement. But the internet commenters have been begging for it, and in I guess about a year it will finally be in dealerships. Can’t say if an actual relationship between those two things exists, but hey, it makes me feel good to imagine decision-makers in our industry read the comments section here. It doesn’t seem entirely clear if the F-150’s diesel option will be marketed primarily as an efficiency play, like Ram 1500’s EcoDiesel, or the heavy power option like it is in three-quarter and one-ton trucks. But the company has stated that the engine was developed “in-house” as opposed to some previous generation Power Stokes which were outsourced to International. As it stands Ford has Power Stroke diesels on both ends of that scale– the frugal 3.2-liter in the Transit van and the mighty 6.7-liter monster in the Super Duty F-250 and its larger brothers. I imagine details on this will come to light over the course of the North American International Auto Show this week. As for the other engines, there are big changes coming to the gasoline options as well. For what seems like forever, a naturally aspirated 3.5-liter V6 was the F-150’s entry option. For 2018 that’s being dropped in favor of a 3.3, which Ford claims “is expected to” have the same output of 282 horsepower and 253 lb-ft of torque that the 3.5 had. Efficiency, which would appear to be this new engine’s objective, has not been quantified for us yet. The old 3.5 was capable of 24 mpg on the highway according to the EPA, so we’re hoping to see a little improvement from that. The 2.7-liter EcoBoost V6 is completely revised for 2018, and Ford has promised improved stats across the board thanks to changes including new “advanced dual port and direct injection technology, reduced internal friction and improved robustness” as stated in a press release. I was impressed with the first production iteration of this engine myself. Empty-truck acceleration was ample and I ran at about 26 mpg with it driving to the desert and back loaded with camping gear. Right now the only player in half-ton diesel trucks is Ram, which offers its 3.0 EcoDiesel with 240 horsepower and 420 lb-ft of torque. It also claims to be capable of 29 mpg on the highway, a spec I’m willing to bet Ford has its eyes on beating. GM’s closest equivalent would be the mid-sized Colorado, which is available with a 2.8 liter Duramax diesel rated to 181 horsepower and 369 lb-ft of torque. But that’s not particularly relevant since the F-150 is a weight class up. 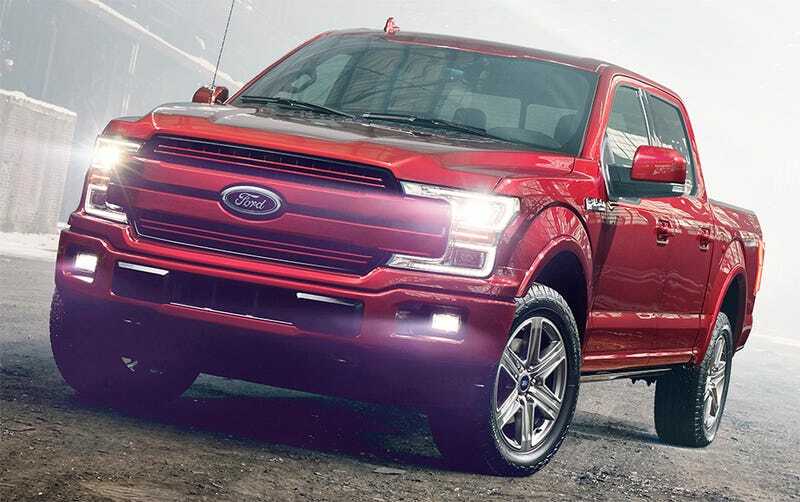 Watch this space over the course of the week as we learn more about the F-150’s revisions and power plants as information comes out from Detroit.